Columbia Car - index of webpages . . . . . .
a division of United States Motor Company (1910-1913). This site was put together by Bruce Duffie, grandson of Lawrence Duffie. important part of the birth of the automotive industry. Chicago to New York, establishing the Record in 1903 and re-taking it in 1904. The next few pages continue the narration, though not in strict chronological order. the company, right though to the end of production in 1913.
or show supporting documentation of what is being presented. [*] Photos of the first Vanderbilt Cup Race course. Though the record-breaking Columbia was shown there, it did not run in the race. The photos, however, give a feel for the roads and conditions met by those fearless drivers. [*] Photos and articles about Columbia Cars that participated in various Glidden Tours, including Charles Barrett in 1906, and Miss Roberta Marks in 1911. [*] Photos and articles about the Munsey Tours of 1910, in which a Columbia Car participated, and 1911, where the Columbia was again the Pacemaker, and also the Referee. Catalogue of Columbia Electric Commercial Vehicles - Trucks and Wagons, etc. 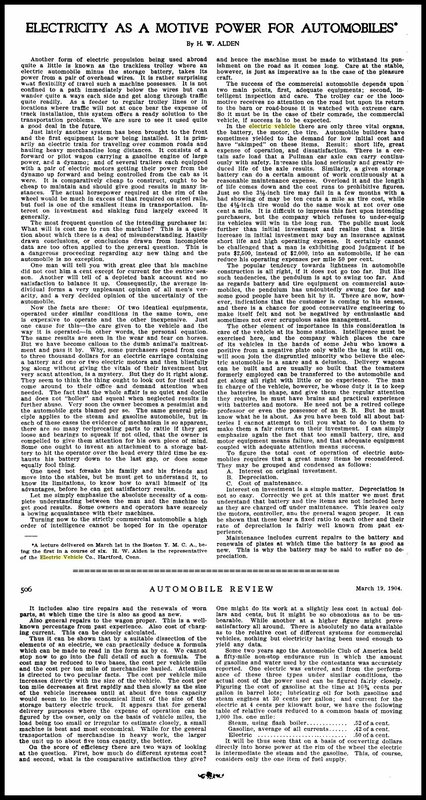 [**] Selection of articles from The Horseless Age deriding the "Lead Cab Trust"
[*] Denotes a "spur" page - one which is linked from within a main page. [**] Denotes a "spur" from the previous "spur" page. The link at the bottom of each "spur" returns to the previous page. The link at the bottom of each main page goes to the next main page. be fixed. I am eager to make and keep this site as correct as possible. Further ideas and suggestions are also welcome at any time.